Hope International University and CADA have joined together to offer a unique benefit to CADA members. Hope International University is providing CADA members the opportunity to complete their California Administrative Services Credential as well as their Master of Arts in Education Administration at a 40% tuition discount. This is a savings of nearly $6,000. 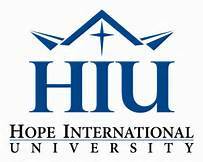 Hope International University is committed to equipping exceptional educators for lives of service and leadership. To that end, the Preliminary Administrative Services Credential/Master of Arts in Educational Administration program will prepare candidates for a wide range of administrative responsibilities in both public and private schools. Prospective students will leave the program with a strong knowledge in developing a student-centered vision of teaching and learning, promoting effective instruction, and managing organizational systems. Embedded field experiences provide candidates the “hands-on” practical experiences needed in preparation for a career as a school administrator. The total cost of the program is $15,200 for the Admin Credential program. This includes all fees except cost of materials. If you add on a masters it is going to be an additional $3,600. They will discount this at 40% for tuition. The resulting cost for Admin Credential program is right around $9,500, and $11,600 for Masters.